“I’m a Republican, but this is a nonpartisan job." Rising sea levels are swallowing coastlines all around the world. By 2100, up to 13 million people living in coastal regions in the US alone could be forced by climate change to leave their homes. The starkness of this looming disaster is best illustrated in Miami, where the streets are filling up, making the future of this thriving tourist hotspot uncertain. Unlike other parts of the country, however, the city and region have huge tax bases to draw on. As funding from the state and federal government remains elusive, this is buying them some time. The city, and the broader Miami-Dade county in general, has another thing working in its favor — climate change is not really politicized. In fact, there’s broad bipartisan support for action. "You have to deal with facts, deal with risks and probabilities, you can’t keep putting your head in the sand." Since becoming mayor in 2011, Cason has been grappling with climate change. He’s convened experts, commissioned analyses and studies, conducted community outreach, collaborated with other cities throughout the US, and, ultimately, developed sustainability and action plans. Cason realizes that parts of the region are too low and will eventually be abandoned, that drinking water will continue to be corrupted by saltwater intrusion, parks and public lands will have to be repurposed, and the Everglades, a buffer against rising sea levels, could become irrevocably damaged. He’s unsentimental about all of this, and his approach goes against the prevailing political tendency to focus on the near-term, the easy wins that can secure reelection. This pragmatic attitude is found throughout Miami-Dade county and could end up safeguarding the millions of people living here. It’s an example of what happens when community and government align. And it’s also a lesson in the importance of framing an issue. One thing that came up a lot when I spoke to those involved in bolstering Miami-Dade county’s infrastructure is that the area has always been engineered. For anything to be built in the first place, marshlands had to be drained. From then on, the environment has been managed and tamed, most notably the formidable Everglades that carpet the land to the Southwest and act as a buffer against the ocean and environmental degradation. 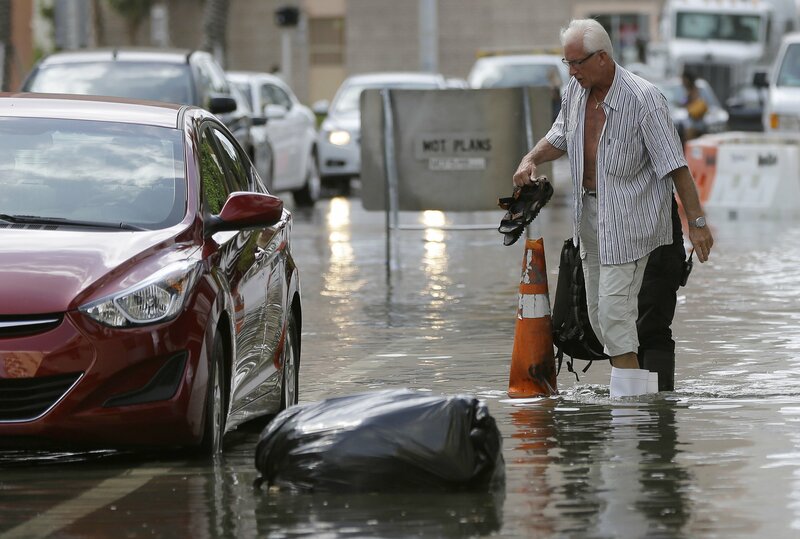 Miami Beach in particular is currently engaged in a massive race against time, busily constructing a $400 million infrastructure project complete with new valve and drainage systems, industrial pumps for getting rid of water, and raised streets. South Florida is especially vulnerable to rising sea levels because it rests on a bed of porous limestone. Walls and levees can’t keep out water that rises from underground. Because of this inconvenient geography, powerful pumps and drains have to be built to carry the water back out to sea whenever high tides seep up from the ground. Even with all its investments, Miami, much like Kivalina and the rest of the world, is feeling the financial pressure of climate change. Billions will ultimately be spent on projects both realistic and unrealistic including repurposing beaches, restoring the Everglades, lifting the streets, injecting resin or clay into underground limestone crevices. Miami-Dade county is also investing $13.5 billion over a decade to overhaul the region’s water and sewage system with climate resilient technology. As sea levels continue to rise, the area’s tax base could shrink as people decide that it’s no longer a good place to live. Further, to limit climate change, fossil fuels have to be kept in the ground and a new model of sustainable energy has to formed. On the one hand, this could entail a massive loss of business-as-usual revenue — from the taxes harvested from fossil fuels to the many industries that depend on them to operate. On the other hand, sustainable energy and adaptation measures require huge investments in technology, infrastructure, and welfare programs. Mayor Cason, for his part, sees this as a golden opportunity for jobs and economic growth. But until others recognize this potential, advocates are calling for new approaches to climate adaptation through new, versatile bodies that can assess each environment on its own terms. “The pattern today has been to wait until after the disaster occurs or displacement occurs to think about the need to move people so usually governments are unwilling to be proactive because this is such an incredibly sensitive issue,” said Alice Thomas from Refugees International said.